I’d been watching the tree shrink on a daily basis. First there were a couple of gnaw marks and then there was a huge gouge out of the trunk. Wood chippings lay scattered at the base and some cascaded into the burn below. Walking past the tree, a short walk through a field near my house in the Kinnettles area of Angus, became the highlight of my evening dog walk, and it never failed to disappoint. 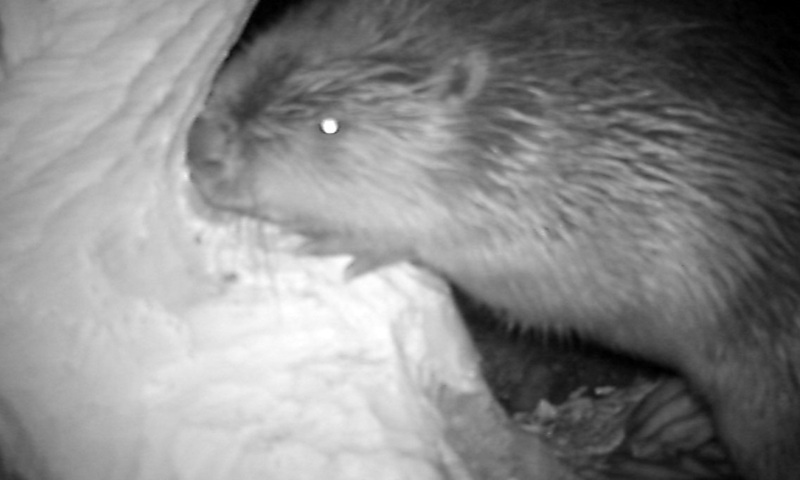 As the thinning willow threatened to buckle, I decided to purchase a camera trap to record the creature responsible. I presumed it was a beaver, but I was desperate to get video evidence. Buying a camera trap (also known as a trail camera) online, I set it up one night last week. It was a fairly easy process, but I feared all the noise I was making splashing about in the burn below the tree might put off any wildlife. I was also worried that my scent might also as a deterrent. Leaving the camera out for just one night, I wasn’t really expecting any footage. So I was amazed to discover that I had not just one clip, but five individual minute-long videos of a beaver gnawing away at the tree. In one clip, he even sneezes violently! At times, he seemed to be aware of the trail camera, peering right up into the lens with his little beady eyes. His thick coat glistened in the night light, and you can tell he had been for a swim. Perhaps unsurprisingly, I also captured a couple of rats scurrying along in the undergrowth. Not quite so nice but evidence of the wildlife that inhabits the land. As morning dawned, other creatures came out to investigate. A robin with a worm in his beak landed on the decimated trunk and gazed up at the trail cam. Another bird – perhaps a chaffinch – hopped along the ground. My next mission is to film beaver babies. Apparently they give birth to an average of three kits and this could happen any time soon. I’m aware there’s a fox’s den and what might be a badger’s sett nearby, so fingers crossed I’ll capture all sorts of creatures on camera. For anyone wondering, trail cameras operate via infra-red technology that detects movement through changes in heat, such as that caused by a passing animal. The infra-red LEDs also mean that photographs or video can be taken at night without the need for a flash-gun or other artificial light. They’re a fantastic way to satisfy curiosity about wildlife in your area, in particular for seldom seen nocturnal animals such as badgers and foxes…and crepuscular ones (those active primarily after dawn and before dusk) like beavers. You can pick them up for around £100, which, in my opinion, is a small price to pay for something which could potentially yield fantastic results.